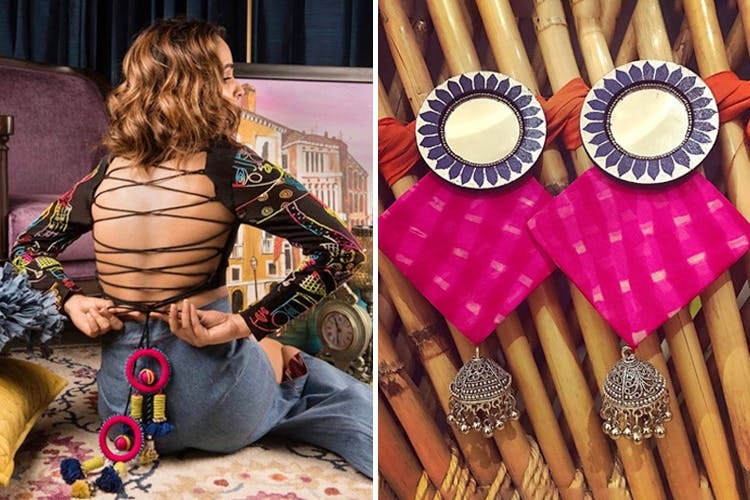 Nakhrewaali's collection of jewellery, blouses and stationery is all the sassy kitsch we've been looking for to make a statement outfit happen. This indie, homegrown brand, started by Gursakhi Lugani, is a sassy interpretation of India’s rich cultural heritage. If there was ever a Holi-inspired collection of accessories, this would be it. Unapologetically over-the-top and dramatic, these pieces are crafted in bright pinks, oranges, greens and blues, tied together by silver. Earrings that fall below the collar bone, matha pattis that fan across the forehead, neon bangles, nose pins, body chains and more–their accessories will add something special to your everyday outfits. We're a big fan of their bold blouses—they're super-colourful, and TBH, we end up checking out their backs first because of the lovely (read HOT) ways they design it in. They've also got a few keychains and notebooks worth checking out. We feel that the prices are a bit steep.